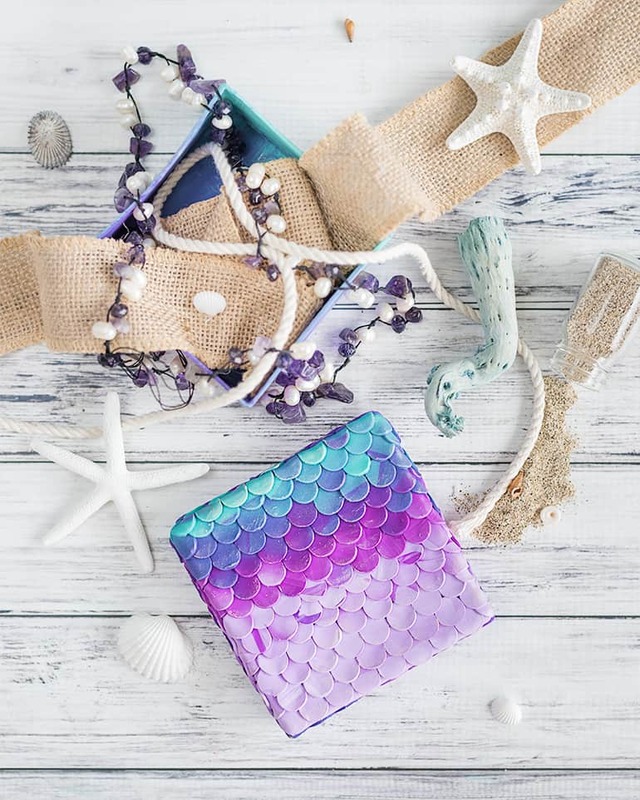 Signs are “in” and mermaids are “in,” so this easy DIY mermaid sign is the perfect way to enjoy both trends! 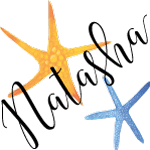 I had so much fun stenciling with a dimensional medium for this footed jewelry box tutorial that I decided to try something similar for this sign. Instead of using a pearl texture paste, I used crackle paste. It’s like crackle paint, only thicker! I’ve written before about my fondness for chalk paints. 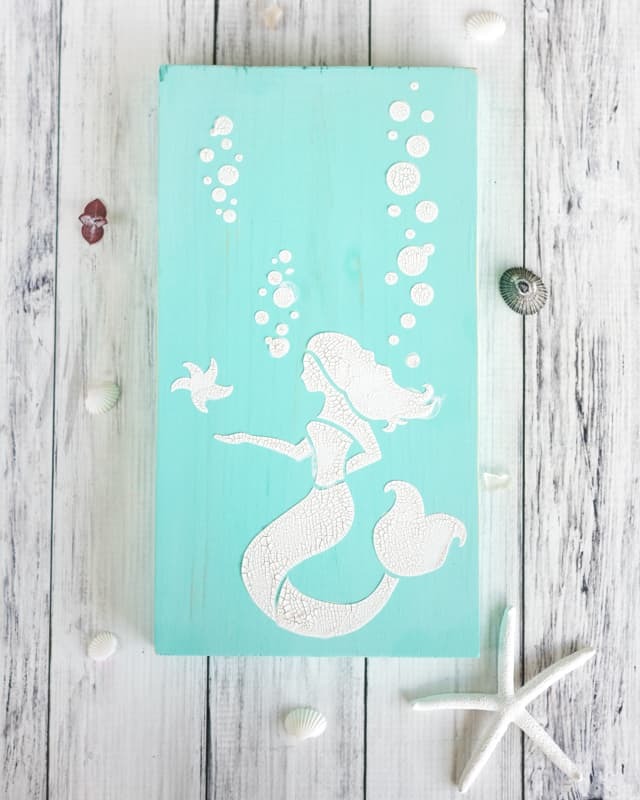 Chalk paint is nontoxic, covers well, has a lovely finish, and is what I used for this mermaid sign. If you don’t have chalk paint, don’t worry – you can make your sign with whatever paints you have on hand. However, if you haven’t experimented with chalk paints yet, I encourage you to check them out! 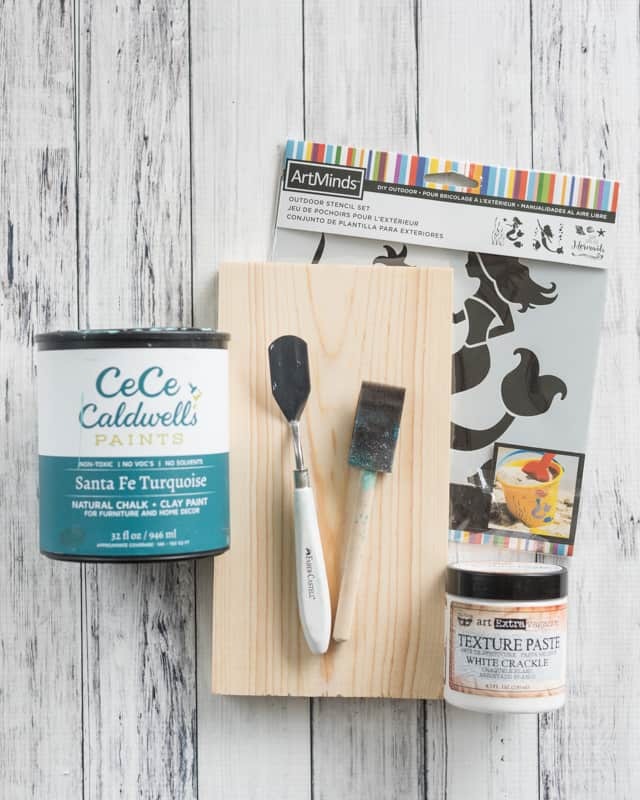 My favorite chalk paints are Cece Caldwell’s because they’re made in America and VOC free. I usually buy them from Glitterfarm beausee I love their great service and prompt shipping. This isn’t an affiliate link or a sponsored post, just my personal recommendation. 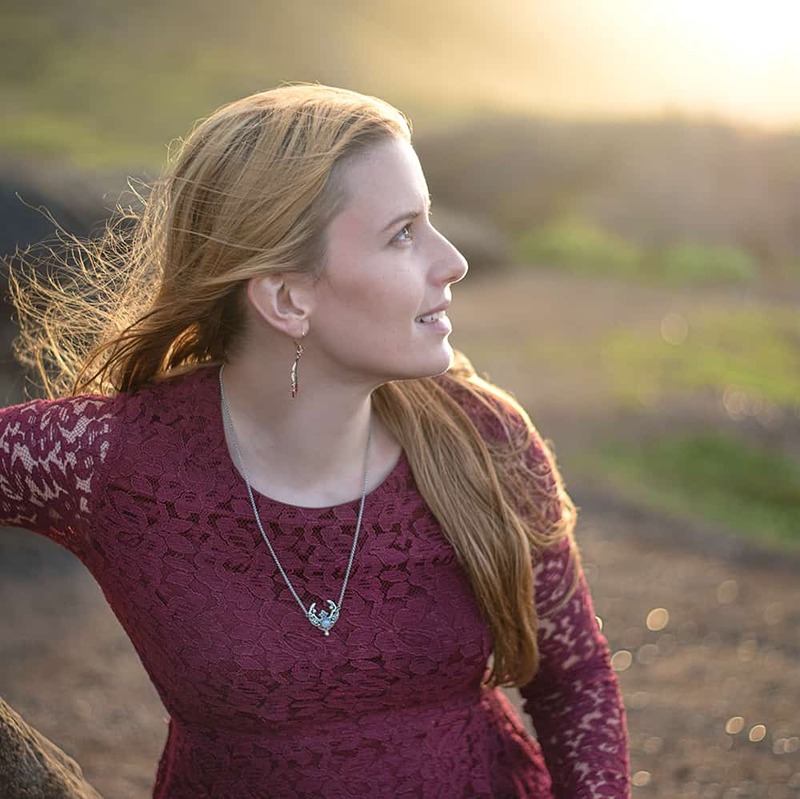 Finding and using non-toxic products is important to me! 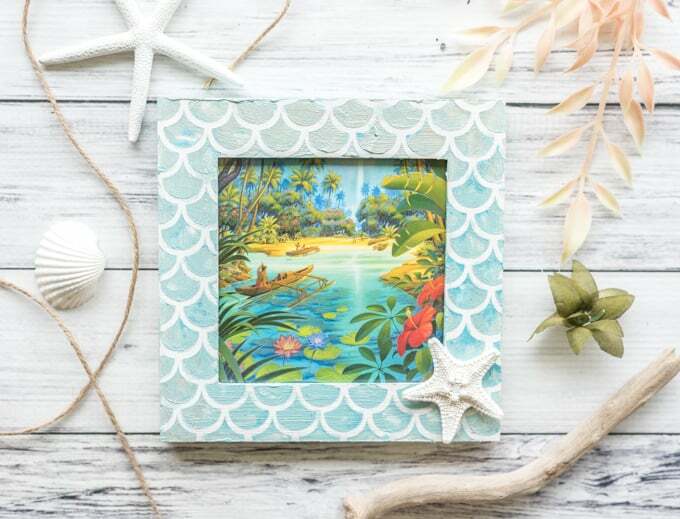 Additionally, chalk paint’s organic appearance just goes really well with the beachy theme of this project – they’re a perfect match! A board – I used 1″x6″ board and cut a 10″ long piece. Most stores give you one free cut per piece of lumber you buy, so just have them cut it at the store if you don’t have a saw! 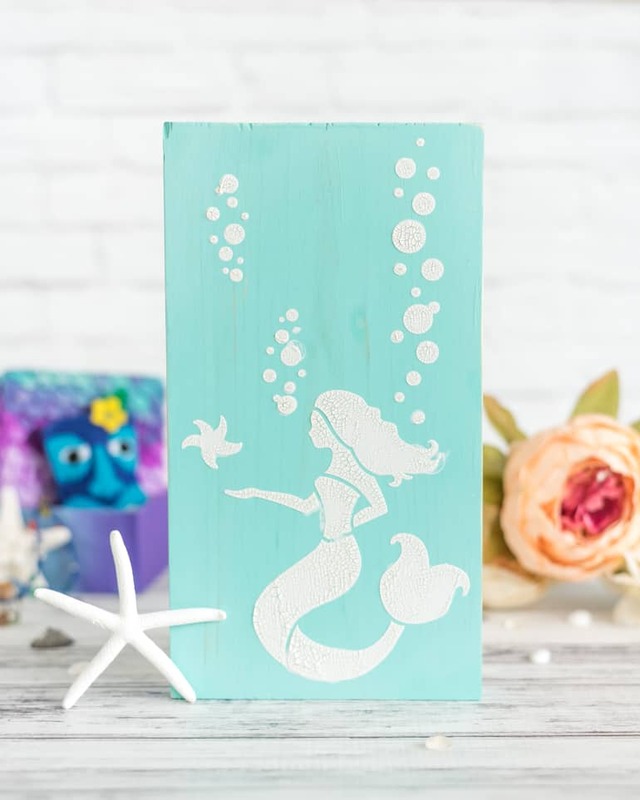 Mermaid stencil set – I used recent Mainland craft store haul! 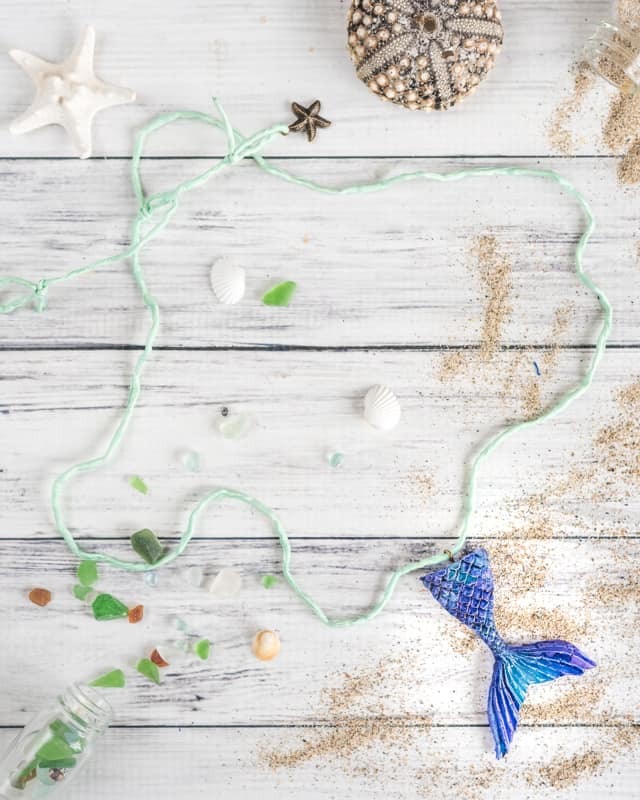 Crackle paste – optional, but it makes for a nice beachy look! If you use crackle medium, make sure it’s in a color that contrasts nicely with your base coat of paint. 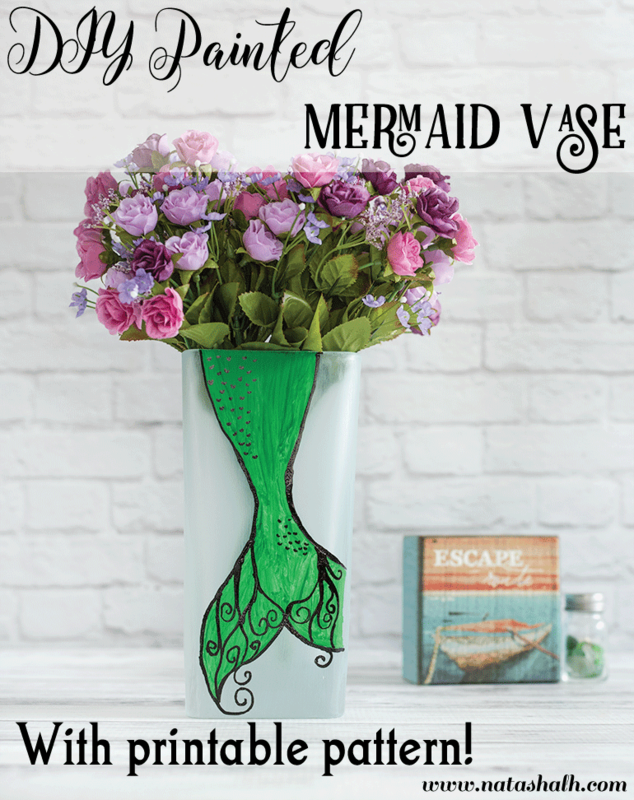 If you’r not using crackle medium, you’ll need a second color of paint for stenciling. A piece of medium-grit sandpaper (something in the 100s. I used 150 grit) – optional. Sandpaper is a quick and easy way to distress your sign a bit for a nice, weathered, beachy look! Temporary spray adhesive – optional. If you’re worried about holding your stencil securely in place, you can always use spray adhesive to help. I did not use spray adhesive with this project, but have in the past with other stencils. Paint your board! It’s easiest to paint one side, allow it to dry, then paint the other. 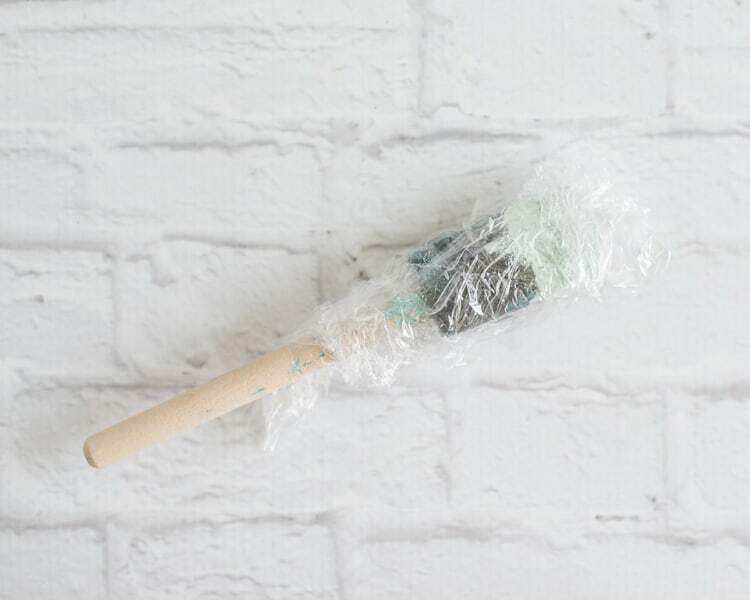 To avoid having to wash your brush multiple times, you can wrap it in a piece of plastic wrap between coats! Once the paint is completely dry, remove some with sandpaper, if you’d like. I used chalk paint, which has a nice, smooth finish if it’s sanded, so I chose to lightly sand the entire front, then more vigorously sand away a few patches to reveal a bit of wood. This gives the sign a weathered, beachy look! Wipe the sign down with a lightly damp paper towel to remove any residue. 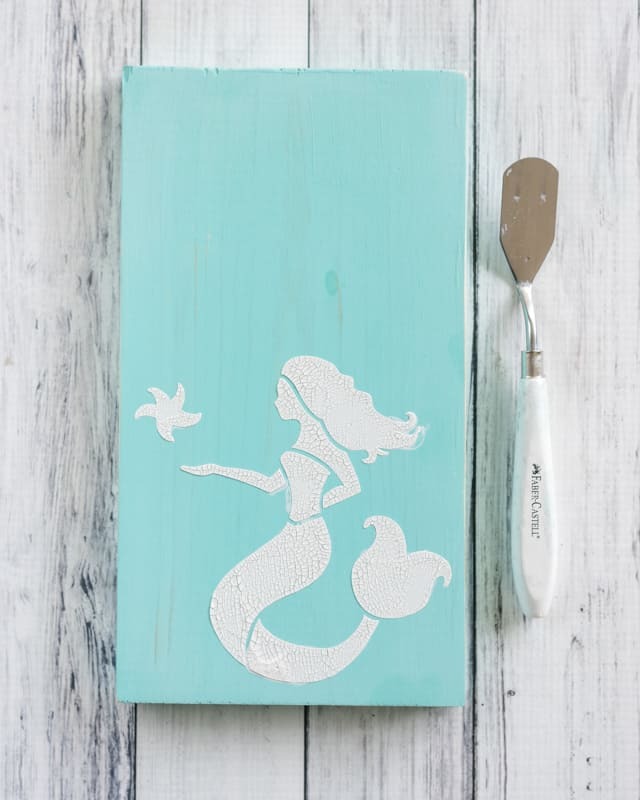 Play around with your stencils before you break out the crackle paste or paint. Make sure you know where you’d like each element to be ahead of time. 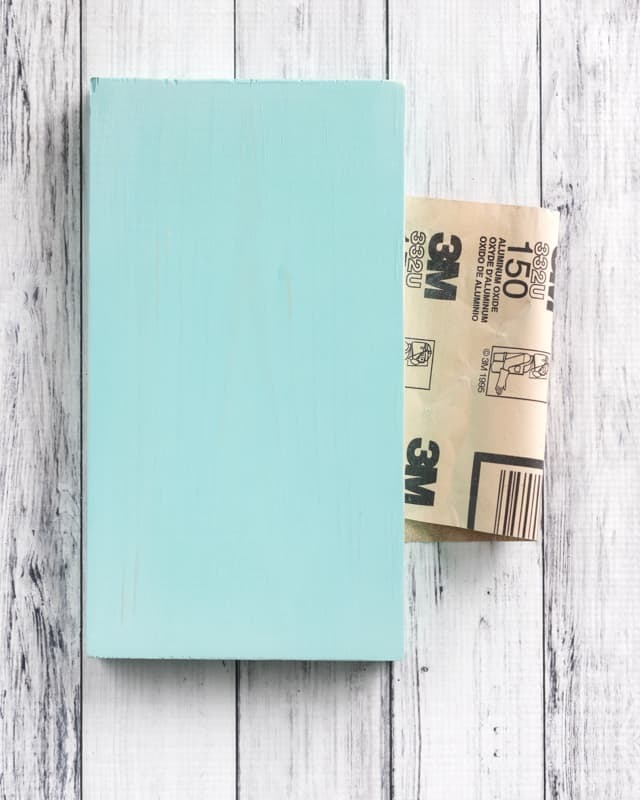 Once you’re sure, use spray adhesive or firmly hold the stencil in place and apply crackle medium with your pallet knife (or paint with a brush). Try to avoid as much side to side action as possible because it tends to make paint/medium leak under the stencil edges. Promptly remove the stencil, then clean it and your pallet knife. Allow the medium or paint to dry completely before layering on additional elements. If you’d like, add a sawtooth hanger to the sign’s back. I suggest placing it in the center about 1″ down from the top. This is completely optional – you can always choose to lean your sign against something or have it standing up on its own (if the board is thick enough). Have you played around with crackle medium yet? And what’s your favorite type of paint? Cute! Lovely in a beach house or cabin!